5.7 Earthquake hits Kyushu, Japan. 5.4 Earthquake hits central Alaska. In the South Indian Ocean: Tropical cyclone (ts) 17s (Frances), located approximately 270 nm north of Broome, Australia, is tracking west-southwestward at 05 knots. 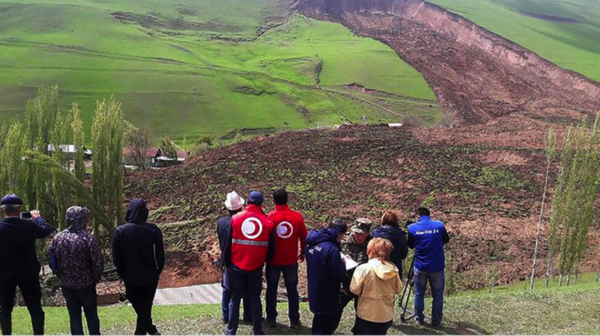 Krygyzstan – A landslide engulfed part of a village in Kyrgyzstan on Saturday, killing 24 people, including nine children, the emergencies ministry said. The earth slip entombed the inhabitants of six houses when it hit the village of Ayu in the Osh region of the mountainous Central Asian country at around 6:40 am (0040 GMT). Hours later, a second landslide hit a neighbouring village on Saturday afternoon, burying three houses. There were, however, no casualties, the ministry said. In a follow-up on the dengue fever epidemic in Sri Lanka, officials with the Epidemiology Unit with the Ministry of Health report 39,313 cases through Apr. 28. This compares with 16,660 cases reported during the same period in 2016. Of this total, local media have reported 65 dengue-related fatalities through Apr. 26. In the South Indian Ocean: Tropical cyclone (ts) 17s (Frances), located approximately 795 nm northeast of Learmonth, Australia, is tracking west-southwestward at 06 knots. 7.2 Earthquake hits Mindanao in the Philippines. Following a tsunami warning, the occurrence of sea level disturbance was confirmed by records of the Sarangani sea level monitoring station showing a drop of approximately 30cm and a maximum rise of approximately 10cm wave height relative to normal sea level. Several buildings were damaged and two people injured as panicked residents fled the coast following the tsunami warning. 5.8 Earthquake hits Valparaiso, Chile. 5.5 Earthquake hits offshore Valparaiso, Chile. 5.4 Earthquake hits Java, Indonesia. 5.4 Earthquake hits offshore Valparaiso, Chile. Two 5.2 Earthquakes hits offshore Valparaiso, Chile. 5.1 Earthquake hits Lake Tanganyika. It’s a mystery that has baffled scientists for more than a century; how salty, blood-red water is able to ooze out from a million-year-old glacier in a region known for its freezing temperatures. When explorer and geoscientist Griffith Taylor discovered a 54-kilometre long glacier in Antarctica that released a deep red liquid in 1911, he attributed the strange phenomenon to red algae colouring the moving water. 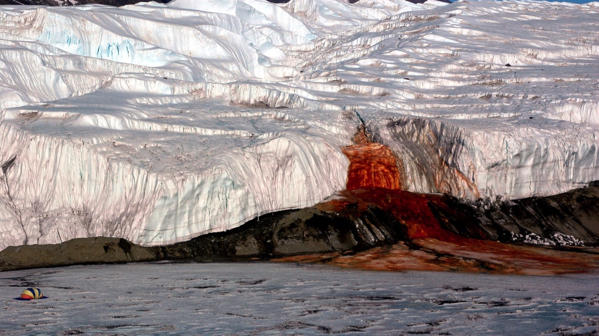 The outflow was quickly dubbed “Blood Falls” for the water’s creepy, red hue contrasting against its icy, white surroundings. It was later discovered, however, that the mysterious water was not related to blood or algae at all. In fact, the colour is the result of iron-rich salt water that turns into a reddish-brown shade or oxidizes (like rust) when it comes into contact with the air. Scientists call the water “brine” because of the incredible amount of salt in it. And now, that saltiness has offered an important clue into one of Blood Fall’s final mysteries – how the brine travels from within the frozen glacier to the waterfall in sub-zero temperatures. Researchers have found that the glacier has its own unique network of pressurized channels that move the iron-rich water to the top of Blood Falls through the frozen glacier. Rescuers have managed to save all the residents of a Russian village before the settlement located on an island in Irkutsk Region burned to the ground. The spread of wildfires across Siberia has prompted authorities to declare a state of emergency. 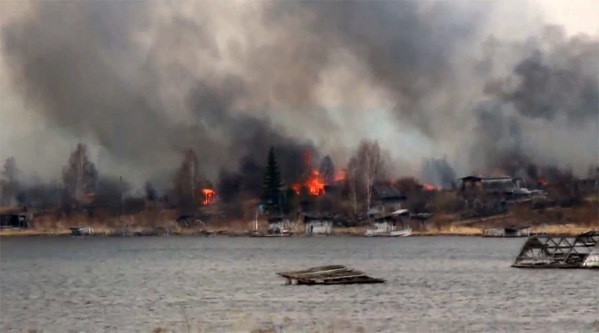 Hundreds of people were trapped in the village of Bubnovka surrounded by water as a massive fire was ripping through their homes. Luckily for some 435 residents, local Emergencies Ministry staff were conducting anti-flood drills in the area and rapidly reacted to the incident. Responding the distress call, they rushed to the scene to evacuate the villagers. Using an air cushion rescue boat, the responders brought people to safety. No one was harmed. At least 59 buildings in the village ultimately burned down. It is believed that the fire was started by a local resident burning trash. Bagana | Bougainville (Papua New Guinea) : Based on analyses of satellite imagery and model data, the Darwin VAAC reported that during 16-17 April ash plumes from Bagana rose to altitudes of 1.8-2.1 km (6,000-7,000 ft) a.s.l. and drifted N, SE, and S. Plumes drifted 55-85 km during 19 and 23-24 April. Bezymianny | Central Kamchatka (Russia) : KVERT reported that during 14-21 April lava continued to advance down the NW flank of Bezymianny’s lava dome. A thermal anomaly was identified in satellite images during 14-17 April. The Aviation colour Code remained at Orange. Bogoslof | Fox Islands (USA) : On 19 April AVO noted that no new volcanic activity at Bogoslof had been detected in satellite, seismic, or infrasound data since a short-lived increase in seismicity on 15 April; AVO lowered the Aviation colour Code to Yellow and the Volcano Alert Level to Advisory. Cleveland | Chuginadak Island (USA) : AVO reported that recent satellite images of Cleveland revealed that a lava dome has been extruded in the summit crater, with growth likely beginning after the last explosion on 31 March. The Aviation colour Code was raised to Orange and the Volcano Alert Level was raised to Watch. Dukono | Halmahera (Indonesia) : Based on analyses of satellite imagery, wind model data, and notices from PVMBG, the Darwin VAAC reported that during 19-25 April ash plumes from Dukono rose to altitudes of 1.8-2.4 km (6,000-8,000 ft) a.s.l. and drifted NE, E, and SE. Ebeko | Paramushir Island (Russia) : KVERT reported that on 14, 16, and 19 April several explosions at Ebeko were observed by residents of Severo-Kurilsk (Paramushir Island) about 7 km E. Ash plumes rose as high as 3.2 km (10,500 ft) a.s.l. Minor amounts of ash fell in Severo-Kurilsk on 18 April. The Aviation colour Code remained at Orange (the second highest level on a four-colour scale). Kilauea | Hawaiian Islands (USA) : During 19-25 April HVO reported that the lava lake continued to rise, fall, and spatter in Kilauea’s Overlook crater. Webcams recorded incandescence from long-active sources within Pu’u ‘O’o Crater, from a vent high on the NE flank of the cone, and from a small lava pond in a pit on the W side of the crater. The 61G lava flow, originating from a vent on Pu’u ‘O’o Crater’s E flank, continued to enter the ocean at Kamokuna. A growing lava delta is building where the lava enters the water. Surface lava flows were active above the pali. Klyuchevskoy | Central Kamchatka (Russia) : KVERT reported that a weak thermal anomaly was detected over Klyuchevskoy during 14-17 and 23 April. A steam-and-gas plume that rose to 5 km (16,400 ft) a.s.l. and drifted 125 km SW on 23 April contained some ash, prompting KVERT to raise the Aviation colour Code to Orange. On 24 April satellite images showed an ash plume drifting 72 km SW at an altitude of 7 km (23,000 ft) a.s.l. On 25 April KVERT noted that activity had significantly decreased and only steam-and-gas emissions were observed. The Aviation colour Code was lowered to Yellow. On 25 April ash was again present in a plume; KVERT raised the Aviation colour Code to Orange. The plume rose 3-4 km (9,800-13,100 ft) a.s.l. and drifted 60 km SW.
Sabancaya | Peru : Based on webcam images, satellite views, and seismic data the Buenos Aires VAAC reported sporadic gas-and-ash puffs from Sabancaya during 18-25 April, sometimes rising as high as 8.2 km (25,000 ft) a.s.l. ; clouds sometimes hindered observations of the volcano. 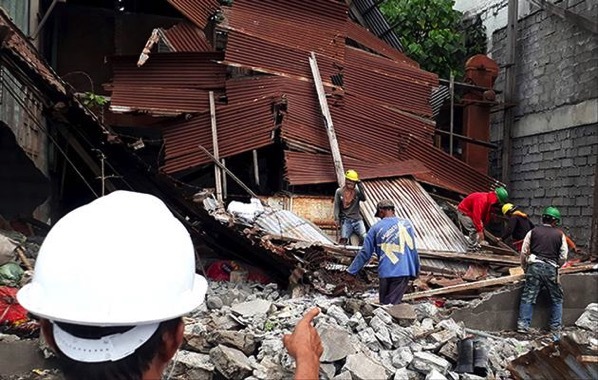 San Miguel | El Salvador : In a special report from 17 April, SNET reported an increase in seismicity and gas emissions from San Miguel in recent days. Earlier that day during 0620-0630 RSAM values spiked to 356, an increase over normal values around 50. During 18-21 and 23-24 April RSAM values fluctuated between 80 and over 300. Sheveluch | Central Kamchatka (Russia) : KVERT reported that during 15-21 April lava-dome extrusion onto Sheveluch’s N flank was accompanied by strong fumarolic activity, dome incandescence, ash explosions, and hot avalanches. Satellite images showed a thermal anomaly over the dome during 13-17 April, and an ash plume that drifted 95 km E on 15 April. The Aviation colour Code remained at Orange (the second highest level on a four-colour scale). Sinabung | Indonesia : Based on PVMBG observations, satellite images, and wind data, the Darwin VAAC reported that during 20-22 and 24 April ash plumes from Sinabung rose to altitudes of 3.3-4.3 km (11,000-14,000 ft) a.s.l. and drifted SW and E.
In the Western Pacific: Tropical Depression 03w (Muifa), located approximately 554 nm southwest of Iwo To, Japan is tracking northward at 09 knots. In the South Indian Ocean: Tropical cyclone (ts) 17s (Frances), located approximately 275 nm west of Darwin, Australia, is tracking west-southwestward at 15 knots. Singapore – Heavy rain caused flash floods in eastern parts of Singapore on Thursday, with vehicles splashing through water-clogged roads and some cars left stranded, unable to pass through. India – Incessant rainfall for the past one week has flooded large areas of Arunachal Pradesh’s capital town Itanagar and caused landslides and road blocks at many points. Landslides occurred at Senki View and Donyi Polo Road, while people in Pachin Colony have undertaken temporary flood preventive measures by constructing bunds with bamboo and filling empty cement bags with sand. A growing number of Kenyans are switching from traditional livestock to drought-resistant camels because of the changing climate. Longer and less-predictable droughts have resulted in three times as many camels being owned today than a decade ago. “My husband and I had over a hundred cattle until 2005. But as the climate became drier in this region, the cows stopped producing milk, and 20 to 30 of our cows even died every year,” Mariam Maalim told Germany’s Deutsche Welle broadcaster. She says her new camels produce milk even during drought. There are now four times as many foxes living in urban areas of England than 20 years ago, or about one for every 300 city-dwelling humans. Researchers found that London has about 18 foxes per square kilometer, while the whole of England is home to about 150,000 of the urban omnivores. But Trevor Williams, of the rescue group The Fox Project, says he thinks that many foxes have become urban dwellers because cities have expanded into their historic habitats. Foxes also seem to thrive in places like London because of the abundance of rats and mice. The week’s hottest temperature was 114.0 degrees Fahrenheit (45.6 degrees Celsius) in Tillabery, Niger.